HashFleek provides search engine marketing services to help you acquire new customers fast. Search Engine Marketing is the process of advertising your business through search engines, such as Google advertising. 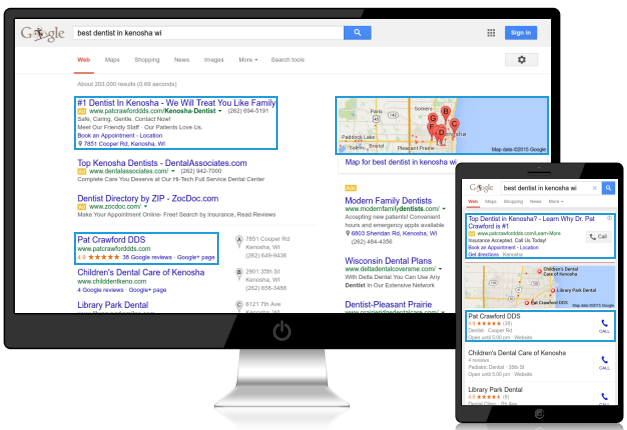 Our search engine marketing team is a Google Partner and AdWords Certified. We help businesses maximize the value of their advertising dollars to acquire new customers at the lowest possible cost. Our search engine marketing service includes thorough keyword research to find opportunities for your business to capture new customers. Keywords are the search terms that people type into search networks when looking for something they're interested in, such as a product or service. We research over 1,000 keywords and measure search traffic, competition, and costs associated to select the best keywords for your advertising campaign. Once keywords are researched and selected, we will closely evaluate your competitors who are advertising on search engines. By looking at what they are doing and what is working for them, our search engine marketing team will be able to strategize based on what they are doing and implement new tricks to stay ahead. Search Engine Marketing is similar to Search Engine Optimization; you have to fight for position. Your position is based on many variables, such as the quality of your landing page, ad text, ad extensions, keywords, and more. Our AdWords Certified Team will work to assure a top-ranked ad position in Google and will optimize each element of your campaign. We handle each component of the advertising campaign creation so that you do not have to do anything. We set-up the campaign, conceptualize multiple advertising concepts, choose the most effective bidding strategies, schedule advertisements, and more. Your search engine marketing campaign will be improved weekly. We analyze the data, optimize what is working, and remove what is not working from the campaign. Our search engine marketing team will be able to pinpoint what are the best times for your advertisements to run and what advertisements are the most effective based on conversions. First, we will identify the main goals of the campaign. Do you want more awareness or conversions? Secondly, our keyword analysts will identify highly searched keywords with relatively low competition. Next, we will create compelling ad messages to grab the attention of your target market. Then, our certified analysts will evaluate the campaign to identify the strong areas and modify weak areas. Once your campaign begins to generate high returns, add more fuel to the budget to maximize the results.